How do I rename a Pinterest pinboard? Been reorganizing my Pinterest boards and would like to rename a few to more accurately reflect their content. How do I most easily do that on Pinterest? That’s great that you are reorganizing and relabeling your Pinterest boards. I think that like too much other social media, people either just let boards become stale or keep using them as the content slowly changes, without ever changing the label. There are two problems with this: first, the content becomes less findable as people search for the newer content that’s not really described by the board name, and second it ends up with things increasingly poorly organized so that multiple boards end up having overlap and it all ends up, well, a big mess. 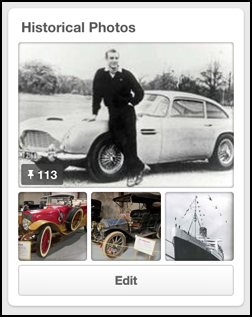 Fortunately it’s really crazy easy to tweak and update a Pinterest board (“pinboard”). Let me show you what I mean, with a board I have that was “Historical Photos” but that I wanted to rename. See the “Edit” button on the bottom? Click on it. Yes, it’s really this easy! Here I’m just going to get rid of the word “Photos” from the Name field, then click “Save”.